Google Chrome’s Bookmarks feature is very basic allowing you to view (default order), import or export bookmarked links. If you happen to bookmarks lot of links and organize them in different folders – you may want to see latest or recently added bookmarks in Google Chrome. By default, there is no option to view latest Google Chrome bookmarks. 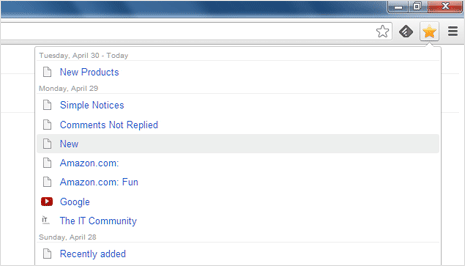 Launch Chrome browser, click on button at top right and then goto Bookmarks > Bookmark Manager option. This will show all bookmarked links in the default view. You can browse specific folders (if created) in the left panel for respective bookmarks. Alternatively, you can use shortcut Ctrl + Shift + O to directly open Bookmarks manager in Google Chrome. 1. Open Chrome and install Recent Bookmarks extension. After install, you should see bright star button added to top bar on the right side. Clicking the Star button will neatly display bookmarks date wise. Handy, isn’t it? 2. By default, it shows 15 bookmarked links. 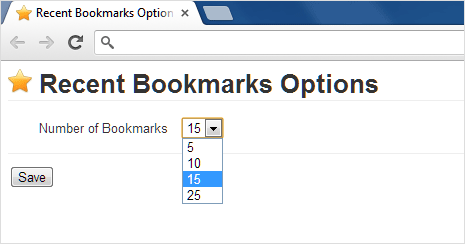 You can increase this to 25 or reduce it to 10 or 5 bookmarks from setting page. Right click on star button and then click Options. 3. Clicking bookmark links in “Recent Bookmarks” box opens in a new tab. This is meaningful implementation as majority of users prefer opening links in new tab as against opening in the same tab. This extension is ideal for viewing recently added bookmarks organized in date-wise manner. Wish it also had option to delete bookmarks from “Recent Bookmarks” box, for that you need to open Bookmarks Manager (as discussed in the beginning).